Generally baked flour is not the best since most of us eat too much already but every so often one has to splurge. Even your non-vegan family and friends will eat you out of these. Place almonds in a food processor and pulse until they are coarsely ground. Don’t over process to the point it becomes almond flour. Place in bowl. Place rolled oats in food processor and pulse until they are coarsely ground. Don’t over process to the point it becomes oat flour. Add the oats to the almonds and then add flour, cinnamon, and sea salt. In a separate bowl, combine oil with maple syrup and vanilla. Mix well. Add the wet ingredients to the dry. Form the dough into small balls and place onto a cookie sheet. Slightly flatten each ball. Make an indentation with your thumb in the center of each cookie to create space for the jam. 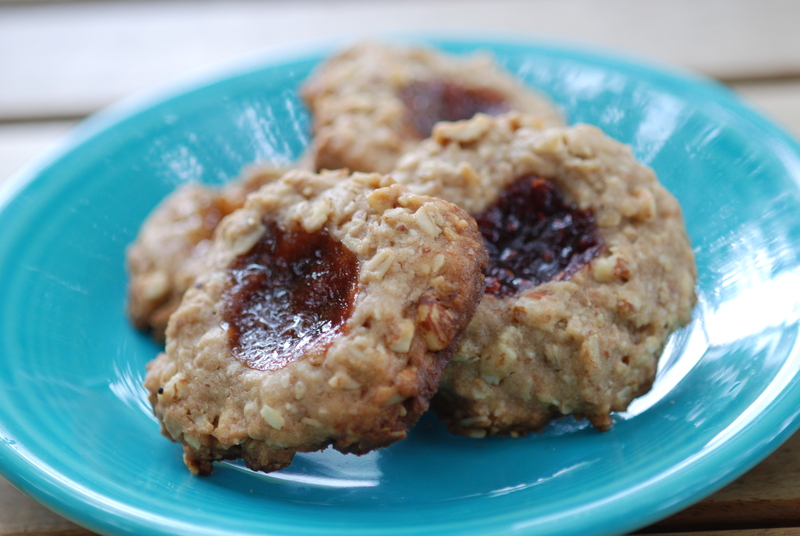 Put 1/2 teaspoon of jam in the center of each cookie. Bake for 20-25 minutes or until the cookies are lightly browned around the edges.